Transports EON, a French fleet specializing in the transportation of bulbs, flowers and plants needed a complete solution for visibility of its assets. It turned to Blue Tree Systems, an ORBCOMM Company for its refrigerated truck and trailer solution to improve visibility and efficiency, maximize trailer usage, and minimize the risk of accidents. The family-run business already had substantial experience with telematics and knew that it required a unified technology all on one platform to manage its fleet of semi-trailers. After an initial meeting at SITL 2017, and extensive further research, Transports EON decided on the ruggedized hardware and robust and in-depth software delivered by Blue Tree Systems, an ORBCOMM Company. Transports EON is a specialist, family-owned transporter of bulbs, flowers and plants, based in the Loire Valley in France. Founded in 1957 in Ste Gemmes sur Loire, the company has been recognized for its expertise in France and throughout Europe for over 60 years. Employing 19 staff, the team is specially trained in the transport of bulbs, hot plants and cut flowers. The company makes regular deliveries from the Netherlands and Belgium to serve Pays de Loire and Brittany. It also delivers daily to the main flower and plant markets in the Netherlands (Aalsmeer and Honselersdrijk) as well as customers throughout continental Europe, in Spain, Germany, Great Britain, Italy and Switzerland. Transports EON already had substantial experience with telematics providers on their trucks after nearly two decades in business. However, they required an extension of the solution to bring together all their assets. The company wanted to manage several different brands of refrigerated equipment and for the information to be available on a single platform to meet the traceability of all goods. They needed to increase the visibility of their semi-trailers and improve the monitoring of their temperature-sensitive cargo. They turned to Blue Tree Systems, an ORBCOMM Company for reliability, traceability and reporting capacity. The fleet decided that the robust BT 300 temperature tracking hardware and the reliable and in-depth FleetManager analytics monitoring tool were the ideal combination to help them meet their business goals. ORBCOMM’s Blue Tree reefer monitoring system provides status and position updates every five minutes as standard. 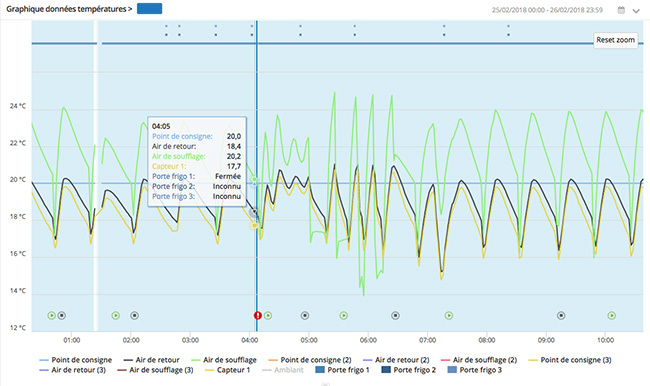 Updates include information on settings, mode of operation, air temperatures, fuel level, door status and many more. Alarm notifications, temperature out-of-range conditions or events like door openings are reported in real-time, delivering complete visibility of all assets in a reefer fleet. Designed and engineered in-house, the BT 300 is a precision engineered hardware platform suitable for all refrigerated vehicle types. The use of the FleetManager platform delivers completely visibility over its entire fleet through a single portal for Transports EON. Transports EON is now able to protect its cargo, improve customer satisfaction and reduce financial and operational risks. 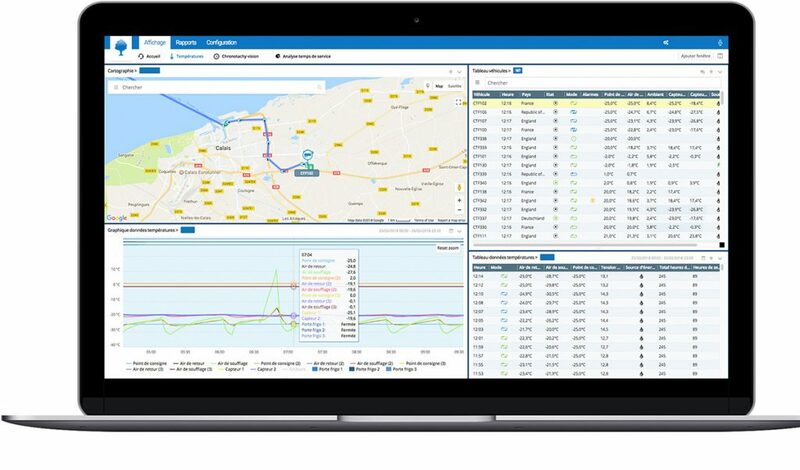 Using FleetManager, the Transports EON team can monitor the status of refrigerated units and track every vehicle in real-time with live alerts. Emailing temperature graphs to customers can be scheduled. Proof of temperature can be emailed with scheduled reporting. Fault and error detection is available in real-time, thanks to direct connection to refrigeration units and monitoring algorithms. This helps to identify any problems or human errors and instantly deliver a message via SMS or email alerts to relevant stakeholders. ORBCOMM’s FleetManager is a cloud-based fleet analytics platform and information management engine which unlocks valuable data for every user in the organization. Join Blue Tree Systems, an ORBCOMM Company at SITL International Week of Transport and Logistics, 20-23 March 2018 at Paris Nord Villepinte – Hall 6. Meet the team at Booth E47.